Disclaimer: This is about a communication device that Anne helped me set up as a backup communication device (all my other backups — mostly bought used, some bought broken to replace parts in dead ones — have by now long since died or otherwise become unusable by me). Make one of these things at your own risk. Before you buy it, look into it more, understanding that so far neither Anne nor I have figured out how to get full functionality out of the software, and that it involves various vaguely techie stuff like looking for DLL files to download and stick in the right directories and stuff, or the thing simply will not work at all. And this device may be totally unusable to some people for a number of reasons that have to do with the size and shape of the machine, input accepted, etc. It’s not a replacement for a primary communication device either, but an excellent backup for some people, and for other it might be what they’d have to settle for until and unless they got something better. Anyway, none of my backups work well enough for me to use at the moment (most don’t work at all), and even my main communication device is well-nigh impossible to use with the telephone in my house because of pesky things like logistics, priorities, and the laws of physics. But I thought this sort of thing would be useful for anyone who has speech difficulties, whether it’s a physical thing, a cognitive thing, an emotional thing, or whatever. Anne said she’s thinking of publishing a guide on putting one of these things together, and that sounds like a good idea to me. Speech-related trouble that is so mild that insurance wouldn’t cover it, but that still impact the person’s life heavily enough they want an alternative. So basically, not everyone can get a device. This isn’t a perfect solution because it still costs money and not everyone has money. But something you can get for anything between $100-400 depending on where you get things and how lucky you get, is still better than getting a worse device for $2000 (yes, I have seen far worse for that amount of money). 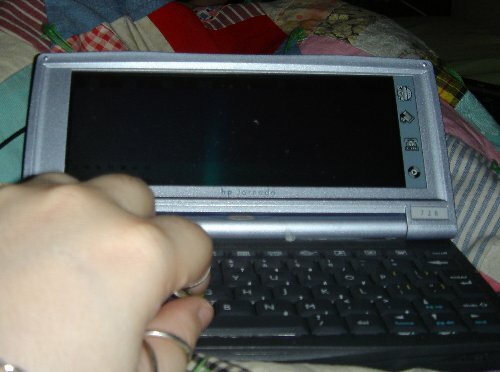 An HP Jornada of the sort that have a keyboard. (Mine’s a 728, Anne’s is a 720.) Although technically this could also run on something that takes a stylus, as long as there’s an onscreen keyboard (in fact parts of it run better on standard PDAs than on this series of Jornadas). I’ve seen these things go for anywhere between $10 and $250, and obviously a lot depends on the condition and where you’re getting it, and also whether you need to buy a new battery for it or not. An external speaker that will have louder sound than the PDA itself (because the PDA has very minimal sound in most situations you’d wnat to use one in), and high enough quality to carry the voice. Anne and I both independently came to the conclusion we’d get Altec Lansing orbits, but there are undoubtedly better things out there than this, especially for people with coordination problems or hand weakness given how it turns on and off. I’ve seen those go for anything from $5 to $100. A couple of DLL files since Jornadas usually run Windows Handheld 2000 and the software is written for more standard Pocket PCs. It’s specific versions, Anne and I are testing a lot of them to see which ones are best. They don’t provide full functionality of the Cepstral software, but then again that might be a screen shape issue. Full functionality, however, is nice, but not necessarily needed. Velcro (Anne’s method so far), duct tape (my method so far), or some other means of affixing the speaker to the back of the Jornada. My hands are there for size comparison, though the angle can make that confusing. Be aware I have small hands. I have not yet got a video for it, and don’t hold your breath waiting, I haven’t been good at making videos lately at all. The portability. Sometimes I don’t have the energy, time, and/or inclination to lug a Dynavox around. The size. Which is the reason I can’t use the Dynavox on the phone at the moment with other logistics and priorities within my apartment. Practically the moment I got this thing together, I had to make a pretty high-priority phone call to one of those services that calls you back later. I hadn’t been able to take those calls by myself in ages. So I didn’t get it a moment too soon. The battery life seems pretty long so far. I have heard it’s longer on a 720 than on a 728, presumably because the 728 has more memory (AFAIK the only difference between the two). I haven’t had time to test this. 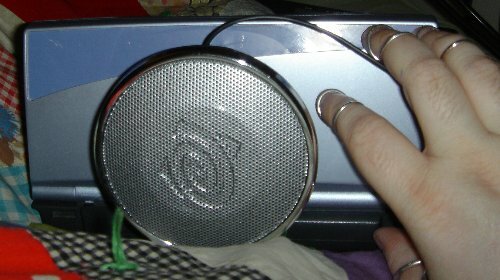 The external speaker is hard to turn on and off, due to having to grab it and twist in a very particular way. It seems like it could break easily too, and it’s gotten stuck in between on and off several times. The DLLs were a pain to get, both of us had to do them from scratch. We might provide better information on that later. I don’t know that this will be a problem for me or not yet, but I’m not sure how durable this thing is. I no longer fling communication devices at walls or bash them on my head, but I’m still given to forgetting I have a hand, and consequently dropping things as my hand reverts to neutral or fails to correct for some other movement. I haven’t figured out a way to mount it to my wheelchair yet, let alone at the right height. 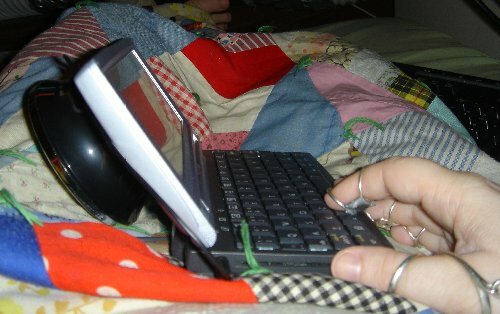 I wonder whether cannibalizing a mount-plate would be feasible, or whether that’d introduce other problems (it’d have to be able to come on and off even the mountplate quickly, because it has a USB cradle it has to fit into for charging and communication with my computer). Don’t know yet. I have not yet gotten Ubuntu linux to recognize the Jornada as even existing, let alone talking to it. Still working on it. Haven’t yet tried using wine, I just booted to windows altogether. I have also not yet tried finding the equipment to plug one into the phone directly. You can buy a thing from Radio Shack for about $15ish IIRC, that is meant for recording telephone calls with and playing tapes back over the phone. You connect it to the phone, flip it into “play” instead of “record”, plug it into the headphone port of the device, and you have a real (if sometimes awkward and ungainly) means of using a device’s sound output directly into the telephone. Depending on the situation an amplifier might also be necessary in between the communication device and the previous doohickey I just explained (I don’t know the word for them). Anyway, I’m very happy with it so far despite its shortcomings, and looking forward to being able to improve on it. I am sure many variations on the same theme can be made, some of them more cheaply than this, some more expensively. Cepstral is a great source of cheap voices. Joel has made JTalk software to be used with different voices, on a different platform. Neither his nor Anne’s projects are intended to replace a person’s primary mode of communication, there’s too much that could go wrong that way. 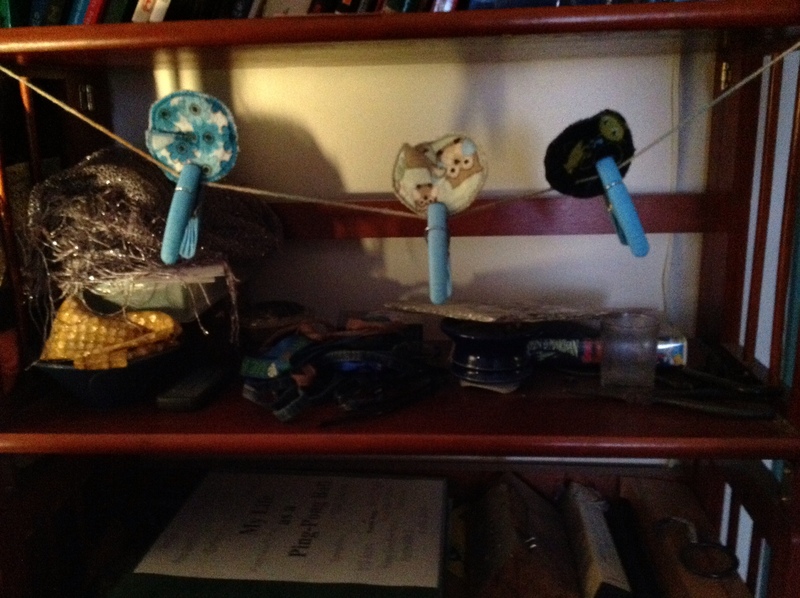 But as a backup or supplement to another means of communication, they can be excellent, and I’m very happy with it. They should do all assistive technology this way. I just finally got my resized ring splints (finger splints), and they don’t look like splints at all. Several people online have asked me to show them and talk about what they’re like in case they or their kids need them, so I’m including pictures and discussing them and their use here. Among other things, handwriting can often be difficult for people who have joint hypermobility. (Here’s the webpage of the hypermobility syndrome association.) That’s when joints bend further than they normally do. The most common cause is benign joint hypermobility syndrome (my diagnosis) which is extremely common, especially among women, and it runs in my family. But there are also several rarer syndromes like Marfan’s and Ehlers-Danlos that have it as one of their traits (and there’s some debate as to whether BJHS is a very mild version of one of those or something separate). A lot of people don’t know they have it unless they have an extremely severe form, although even some people with the rarer and more severe problems don’t get diagnosed easily. There’s a fairly easy way to test yourself to see if you should get checked out for it, which is this test (in which I get either a 7 or 8 out of 9 — but be aware it’s possible to do it wrong if you have perceptual problems, the first time I saw such a test I thought I scored lower than a doctor and PT scored me as; also be aware that if you have various other symptoms (especially widespread joint pain or dislocations), or if a close relative does, you can still sometimes be diagnosed with BJHS with a score between 1 and 3, so best to check with someone who knows what they’re doing. Should problems occur from lax joints or immature or unusual grasp, then the child may be referred to an occupational therapist or physiotherapist for assessment and remedial activities. This should be a priority with a young child, since so much school work requires the use of a pencil or pen. So, I’d always thought I was “just” dysgraphic in school. I was always having my grip corrected and my only way to produce neat handwriting was to eventually learn to ignore severe pain in my hand. I had one set of people try to help me grip it better in elementary school, and another set of people while I was in college, but nobody did an assessment of my flexibility levels. 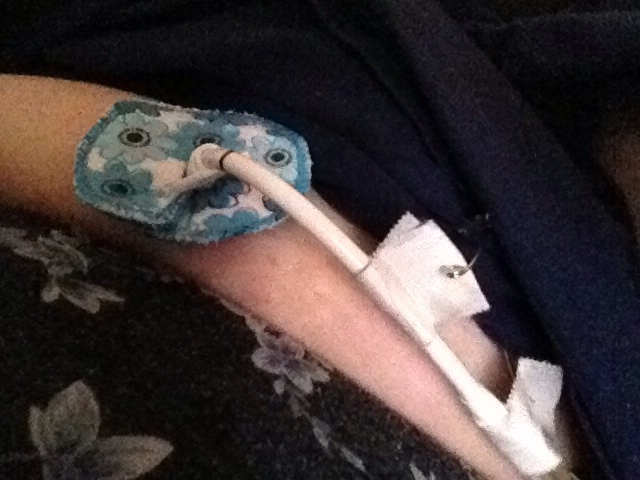 Then after diagnosis with hypermobility last year, all this stuff started to make sense. You can see that in one picture the joint bends backwards a lot and in the other one it doesn’t. It hurts just to hold a pen like that for less than a minute. And the difference it’s making for me is less pain while handwriting, less pain while typing, less pain in general. The actual bending itself doesn’t directly cause the pain. What does cause pain is the constantly having to press harder and further on everything because if I press more lightly my fingers just bend back instead of accomplishing whatever they’re supposed to accomplish. (This is why people with hypermobile fingers are usually slower at playing certain musical instruments, there’s a finite rate at which we can press because it takes us longer.) And having them bent backwards like that in the long term doesn’t do any favors to my joints either. Which is why I’d say, if your kid is having trouble with handwriting, please get them checked for this. I’ve talked to way too many people who are parents, or who know parents, with kids with handwriting problems, and I ask if the kids are super-flexible, and they say yes. But they rarely connect the two on their own, and neither do the schools. I wish I’d had them when I was seven years old and struggling to handwrite only to be accused of not trying when my hand gave out, and having even my odd (they called it ‘immature’) grip seen as a behavioral problem rather than a physical one. I really believed that ‘not trying’ thing, too, since I had no sense of what was and wasn’t normal pain-wise. So I eventually learned to ‘try’, which meant, mask pain to the best of my ability and keep writing, and I finally got neat handwriting five or six years later (and in fact got so skilled I could write in several different handwritings, forwards and backwards, because of how hard I was working). But that hasn’t entirely lasted as I’ve gotten more body awareness than I used to have, as well as more of a sense of how much pain is too much to ignore. When I tried handwriting in the occupational therapist’s office today, I kept waiting for the pain and it didn’t happen. I’m not sure thumb-related pain will fully go away (see below), but I didn’t experience it today. And I certainly didn’t experience the general hand pain I normally do that probably comes from stress on the things that do all the moving things in the joints (I don’t know all the words for these things). The big one with the chain attached is a thumb splint. The other two are two kinds of finger splints: One to prevent mild-moderate hyperextension and the other — the one with the little round spacer thing in between the two rings — to prevent severe hyperextension. I’ve got the mild-moderate ones on my pinkies and middle fingers, and the severe ones on my pointer and ring fingers. The one thing the occupational therapist said these things could not do, is fully stabilize the base of my thumbs, or stabilize at all the base of my pointer fingers, which are my two loosest sets of fingers. She said it’s just not capable of that level of support and I’ll have to try something else if I want more support than I’ve got on those. I’ve also got less pain typing. Normally there’s a sort of sharp pain that starts in my wrists or hands and shoots into my fingers, very similar to what walking without ankle braces does to my legs. And that’s gone as well as far as I can tell. I know there’s been some progress in making other assistive technology attractive, but it hasn’t come as far as these splints have for the most part. The interesting thing to me, also, is that assistive technology likely to be used by non-disabled people (which is to say, most assistive technology, of the sort that isn’t normally singled out as assistive even though it is) is often already made with aesthetic considerations in mind, whereas assistive technology for disabled people (the kind that is normally singled out as assistive) generally isn’t. Since, of course, assistive technology primarily used by non-disabled people isn’t singled out as medical, and since, of course, medical seems to mean uncomfortable and ugly a lot of the time when it comes to equipment. And, basically, if you have the means to get any splint that works this way for you or someone you know who needs it, you should try. It has been worth both the wait (since February, and a longer wait than usual because I had to send most of them back to the company for resizing) and the hassle. I’ve been letting anyone know who seems to have hypermobile joints (which is a lot of women I run into and a few guys, including a staff person who described getting out of class in high school by popping his thumb out and claiming it was broken), almost all have been interested, and almost none have ever heard of this as a potential cause for their joint problems or handwriting problems. Same with parents I talk to whose kids have this problem, they’ve often never heard of it (or of any solutions for it) even if the school is kicking up a major fuss over things like handwriting and even if the kid is really obviously flexible. So anyone who might run into someone in this situation, keep that in the back of your head, because doing something about it can save a lot of headaches (or, I guess, hand-aches).